I cant use any custom skin no matter what player model i use. When i try to use a custom skin it just gives me the screen you see in the attached screen shot. 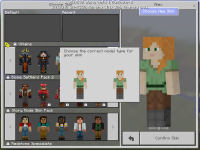 I can use skin pack skins fine but once i switch to a differant skin from default i dont get the custom skin option anymore.